After 100 days of being married we decided it was time to buy our first couch together. Kristina really had her heart set on a sectional. After looking at a couple of big furniture chains we came away uninspired. Everything we found was boring and didn’t fit our idea of the right sectional sofa. On Saturday we decided to go look at Belfort Furniture out by the Dulles airport in Sterling, Virginia. Belfort is like Disney World for furniture. They have four different showrooms with all kinds of different styles and options. 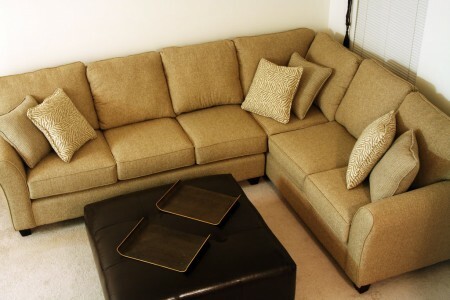 We were browsing their clearance section when we spotted this modern, tan, two-piece sectional. The fabric is microfiber, which is easy to clean as well as comfortable against the skin. Most of the other microfiber furniture had a suede texture but this piece had a kind-of tweed texture to it. This stood out to us as it made the couch look a little more sophisticated. 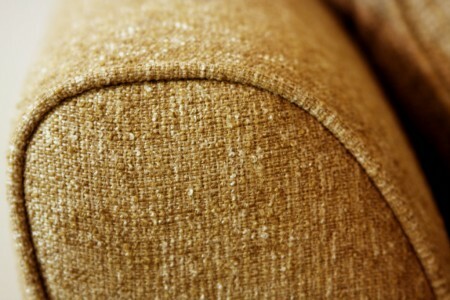 Plus suede can look weird on large furniture because it looks lighter or darker depending on how it is rubbed. The cushions also felt better than the other sofas we tried. 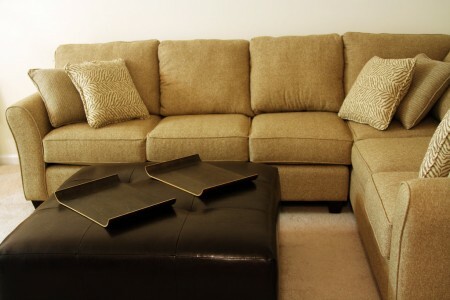 Our couch strikes the delicate balance of being firm yet comfy The cushions on another sectional that we looked at felt weak and we were worried they would become too mushy/clumpy after a couple of years of use. We also got a giant ottoman to stretch out and rest our feet on. I like this better than a hard coffee table. We got our three pieces of furniture to our place in Alexandria thanks to my dad and his pick-up truck. We had to tie the smaller section to the roof and put the ottoman in the back of the crew cab but we got everything home in one trip. We’re really happy with our furniture purchase and look forward to lounging out on it (just like I’m doing now writing this post) for years to come.